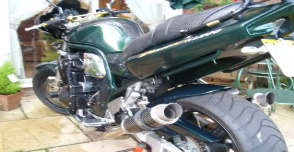 I just picked 2003 Suzuki Bandit 1200s for $1850 with 14,409 mi. Hopefully I will get to throughly enjoy it like I did my ZX550. I was wondering does anybody else get a jerky feeling when cruising at a low rpm? hi Banditbill22 from The Wirral UK .yep I had the same on my mark1 but it was more pronounced when the motor was cold?It vanished after a few mins and a few miles.I guess a big motor takes a while to warm up?hope this helps?regards Bill I also own a550 kwacker its a92 zephyr and runs fine . thanks for the reply tiger .my mk1 has a 4 into 1 pipe with a motad can straight thru which I had to baffle as it was attracting interest from the local constabulary !It only started doing this a few months ago?I'm pretty sure its from the back end?maybe I've overtightened the rear axle after chain adjstmnt?Its one of those quandries that's got me beat!Its like a binding noise and you're right it appears just around 2.5 to 3 k?As we say here in scouse land "It's doin me head in! !Cheers mate..